BOCA RATON – One day before his Alabama team plays Washington in an NCAA football semifinal game, Lane Kiffin has added another member to his FAU coaching staff. Mississippi safeties coach and special teams coordinator Corey Batoon will join the FAU staff, a source tells OwlAccess.com. In coming to FAU, Batoon will be reunited with Chris Kiffin, who was Mississippi’s defensive line coach before heading to Boca Raton to serve as brother Lane’s defensive coordinator. 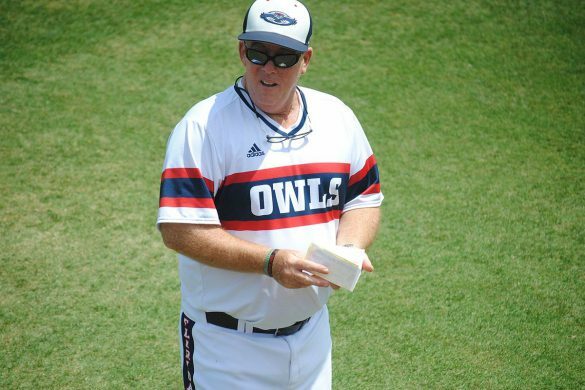 On Friday Tennessee-Chattanooga announced that Chris Hurd, FAU’s special teams coordinator under previous coach Charlie Partridge, had joined the Moccasins staff. Hurd also coached tight ends for FAU. Batoon has 20 years of experience as a college assistant coach. Prior to his stint at Ole Miss, Batoon also worked at Arkansas St. and Northern Arizona, where he rose to the level of defensive coordinator. The hiring of Batoon creates a potential traffic jam among defensive back coaches for the Owls. Last week Kiffin hired USC defensive administrative assistant Keynodo Hudson, whose primary experience is with defensive backs. 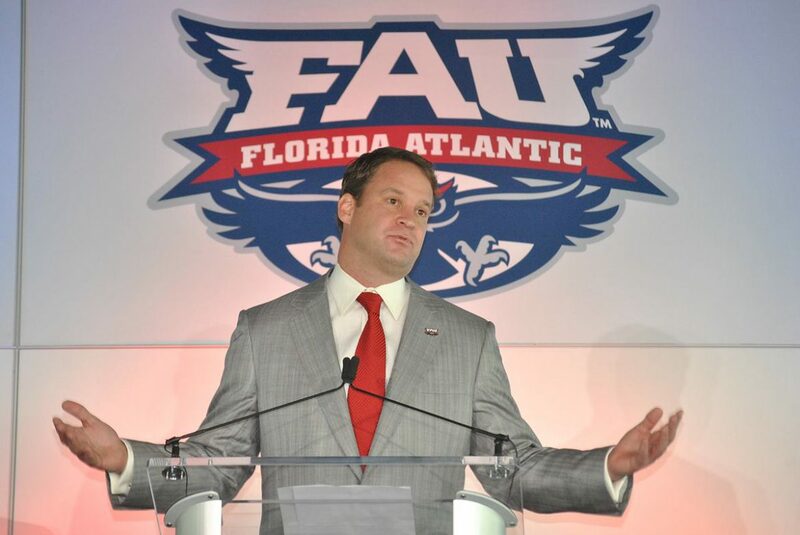 Lane Kiffin also elected to consider keeping FAU defensive backs coach Corey Bell. It isn’t immediately clear whether the hiring of Batoon means Bell is no longer being considered for a position on the new staff or whether Bell, Batoon or Hudson could coach a different position – likely linebackers. 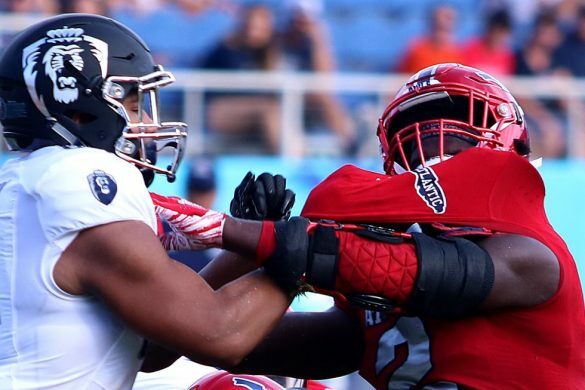 BOCA RATON – The maniacal play of Trey Hendrickson aside, FAU’s defensive unit struggled throughout most of the 2016 season. Only five teams allow more than the 39.8 points per game they have. Four teams surrender more yards. 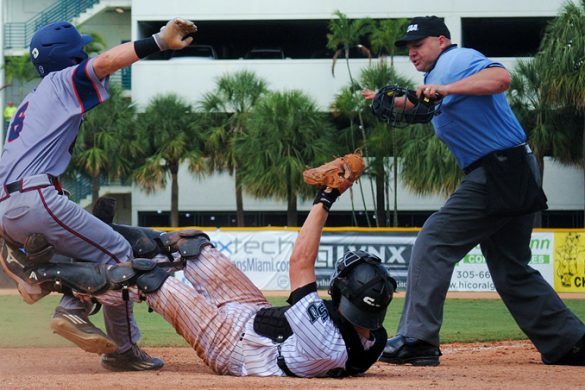 A quick search for memorable defensive plays didn’t yield many offerings. 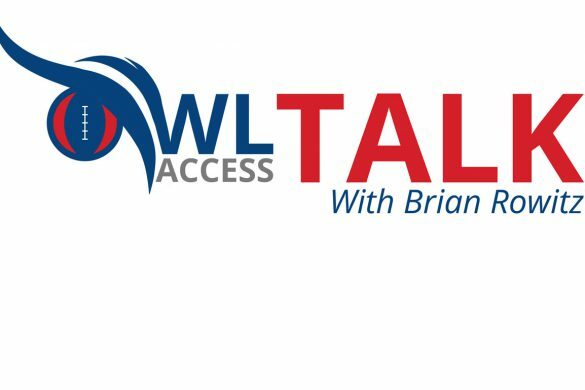 Joining our Chuck King and Jake Elman in offering their superlatives are three colleagues from ESPN West Palm: FAU play-by-play man Ken LaVicka, analyst Kris Bartels and producer (and host of OwlTalk) Brian Rowitz. Today we tackle the Defensive Player of the Year. Kris Bartels (ESPN West Palm): Third down and four and UTEP tries a jet sweep to the left. Jacob Douglas got toasted on the same play earlier in the game, but does a better job making the running back bend the play further into the backfield. 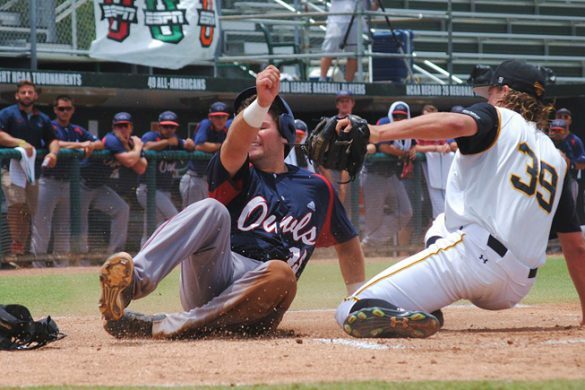 Just like Superman, Trey Henrickson flies in from nowhere to make a huge stop for the Owls. That play forced UTEP to punt after having the lead, 31-28. The Owls had to drive 96 yards in under 3 minutes. Kind of disappointing that this is the “Play of the Year”. For a team that had a ton of big plays in 2015, the 2016 defense looked sub par. At least this play gave the offense a chance to go down and win the game, instead of giving up a game winning play of their own. 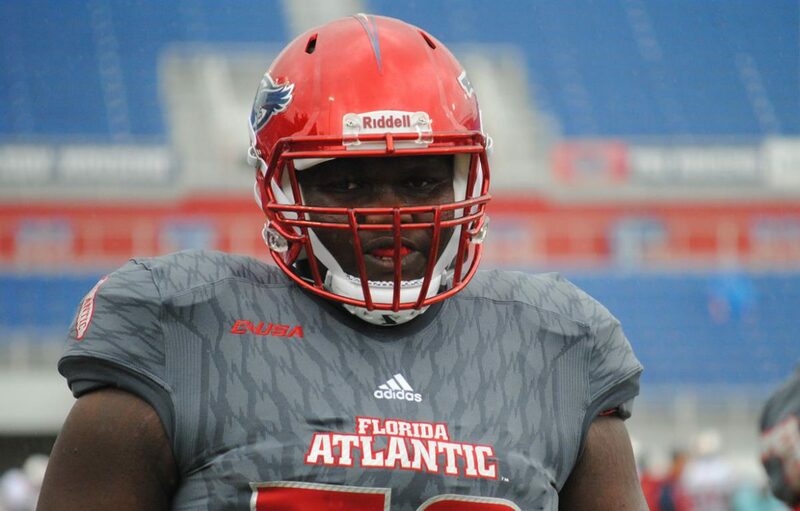 Chuck King (OwlAccess.com): Frequently over the past three seasons FAU found itself in a position where one defensive stop could prove to be the difference between victory and defeat. Most of the time the Owls didn’t rise to that challenge. Against UTEP, they did. With FAU trailing by three late in the fourth quarter and the Miners facing a third-and-four, linebacker Jacob Douglas burst into the backfield to disrupt the UTEP sweep and Trey Hendrickson made the tackle for a loss, forcing a punt. FAU took advantage, marching 96 yards in the closing minutes for the winning TD. Brian Rowitz (ESPN West Palm): Forced Fumble Against Charlotte. Not easy to pick a play here but am going to go with a huge play that almost resulted in an enormous win. With Charlotte on its way to running out the clock FAU Trey Hendrickson forced a fumble and then somehow came out of a pile with the ball, giving the offense one last chance. 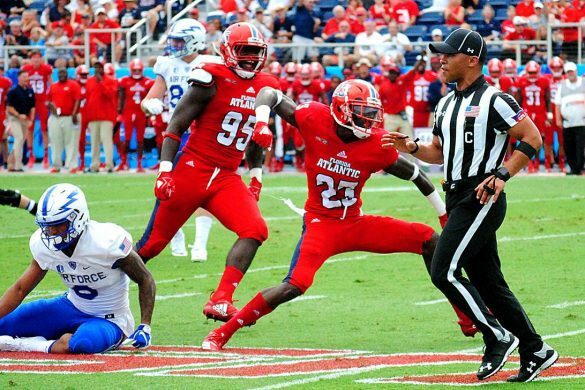 The offense took advantage of the opportunity but unfortunately for the Owls C-USA refs had other plans. Ken LaVicka (ESPN West Palm): Azeez Al-Shair INT return for a TD against FIU. 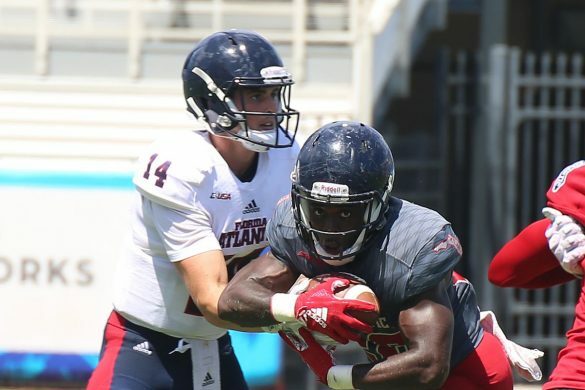 Al-Shaair, who had been relatively quiet from an “impact play” standpoint to that juncture of the season, gave FAU an immediate lift on the first play of the second half against Florida International, hauling an Alex McGough pass into his chest and racing into the end zone to give the Owls a two-score lead. Unfortunately for FAU, it would go for naught. 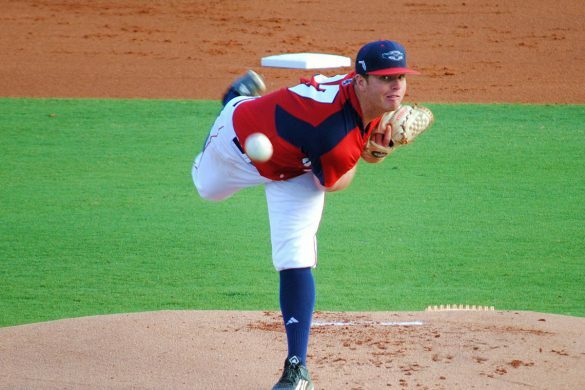 Jake Elman (OwlAccess.com): It all comes back to Trey Hendrickson on defense. 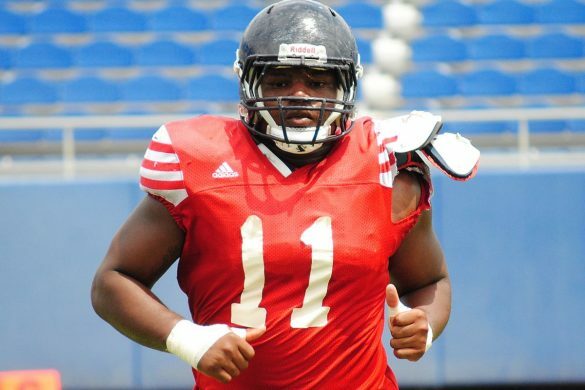 With the game on the line against UTEP, the 2016 Conference-USA Player of the Year blew past two offensive linemen to record a tackle for loss and force the Miners to punt the ball back to FAU. 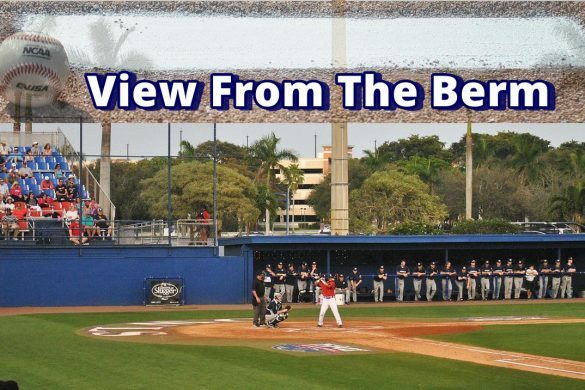 BOCA RATON – Three days after Christmas, the Florida Atlantic Owls played like they’d all received coal in their stocking. 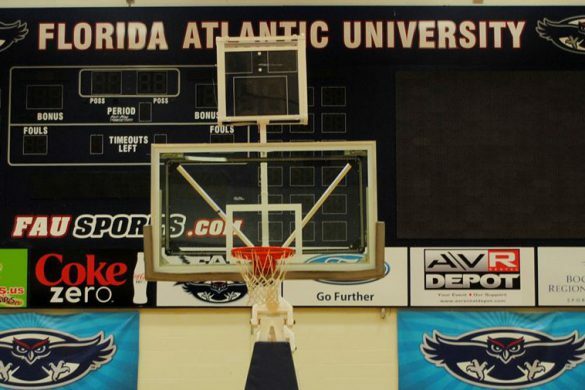 On the eve of conference play, FAU found itself on the losing end against Florida Gulf Coast Eagles,75-62. Wednesday’s loss was more of a blowout than the 13 point final score shows. FAU, which entered its last non-conference game of the year with a 3-1 record at home, went into halftime down 38-24 and never recovered from the early deficit. Having taken nearly three and a half minutes to score their first points, the Owls never led during the entire 40 minutes. 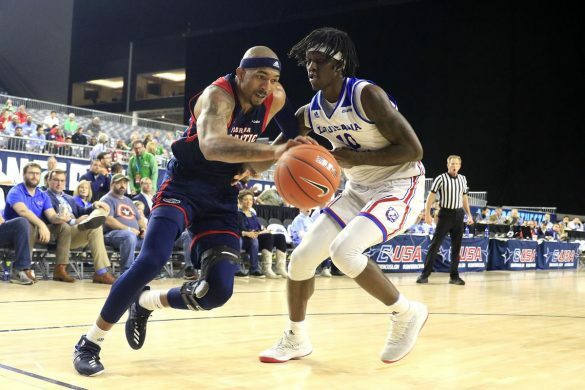 In their final non-conference game of the season, the FAU dominant play in the paint was nowhere to be seen as Jailyn Ingram and Ronald Delph combined for only 9 rebounds between them. Delph’s three rebounds were a season-low. Eagles junior guard Christian Terrell led all players with 20 points. FCGU’s top scorer, Brandon Goodwin, was not far behind with 18 points. FAU sophomore Jeantal Cylla led the Owls with 16 points, the final three of which came after a buzzer-beater to end the game. Justin Massey was the only other Owl to reach double-digits in scoring. 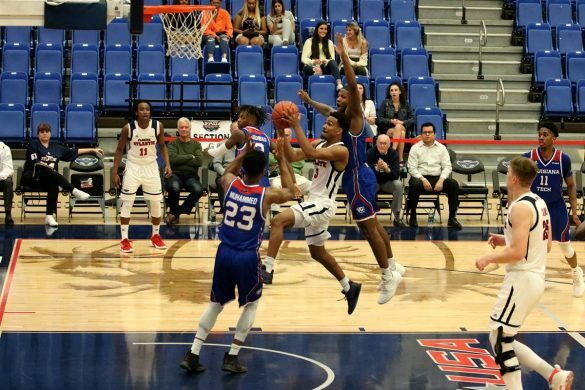 Moving Forward: The Owls finished 4-7 in non-conference play, much better than last year’s 2-11 record… Owls sophomore Justin Massey, who scored 15 points in 19 minutes against Webber International, scored 10 in 18 minutes tonight…FAU forced 17 turnovers from FGCU. 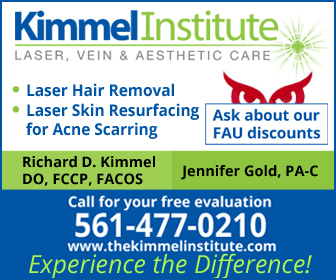 Moving Backward: FAU went into halftime losing yet again, this time by a 38-24 margin…the Owls made only four of their first 15 shots from behind the arc, but rebounded to make 4-of-6 in the second half…Nick Rutherford shot 2-7 from the field…the Owls committed 15 turnovers of their own. Instant Message: “You get into conference play and you get into some teams that are not just sitting there and they’re going at different guys on the floor. You gotta be able to manage your position better.” – Curry on Gerdarius Troutman’s recent defensive struggles that led to him only playing five minutes against the Eagles. Up Next: FAU will open Conference-USA play on Saturday afternoon with a home match-up against the Western Kentucky Hilltoppers. Tipoff is slated for 1 p.m.
BOCA RATON – With our Offensive and Defensive MVPs selected, we’ll move on to some of the most memorable plays of the year. The 2016 season offered a surprising amount of remarkable plays, considering FAU managed only three wins. Some of the ones that weren’t selected by any of our panelists include all of Buddy Howell’s record breaking touchdown runs and all of Devin Singletary’s electrifying dashes. 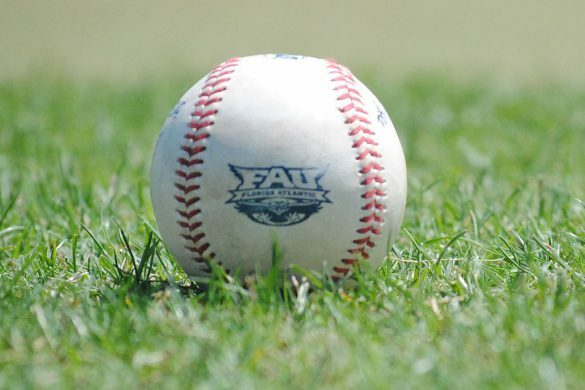 Joining our Chuck King and Jake Elman in offering their superlatives are three colleagues from ESPN West Palm: FAU play-by-play man Ken LaVicka, analyst Kris Bartels and producer (and host of OwlTalk) Brian Rowitz. Chuck King (OwlAccess.com): With all apologies to Charles Dickens’ fans, it was the best of plays, it was the worst of plays for FAU. 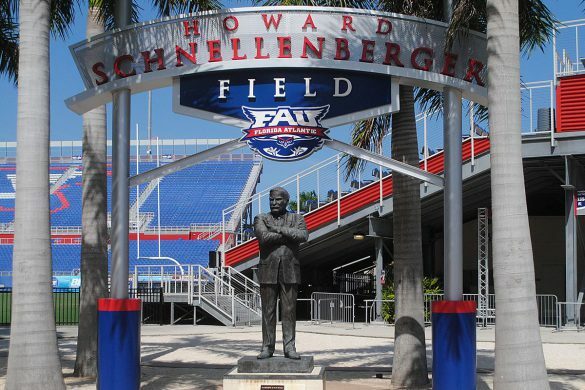 Needing a touchdown on the game against Charlotte’s final play, FAU quarterback Jason Driskel lofted a Hail Mary toward the back right corner of the end zone at the open end of Howard Schnellenberger Field. Wide receiver Karmin Solomon out-leaped two 49er defenders, coming down with the ball. Officials ruled Solomon in-bounds, giving the Owls the victory on the games final play. Until they changed their minds. After reviewing the replay, the officials reversed the call, saying Solomon didn’t get a foot in bounds, turning FAU jubilation into crushing disappointment. 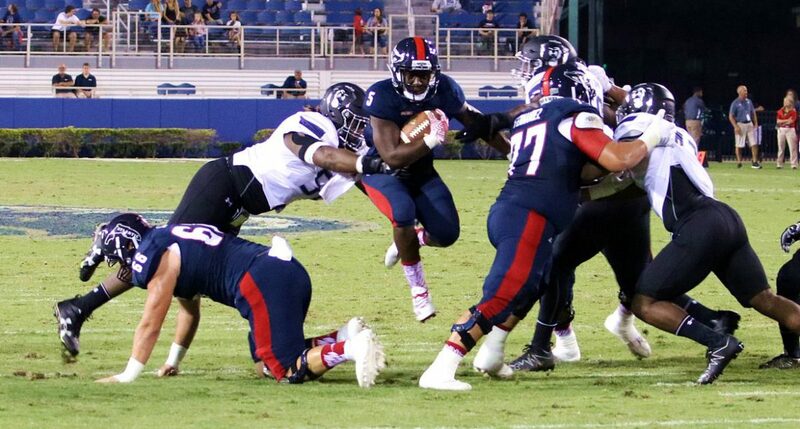 The play – and the game for that matter – encapsulated FAU’s season. 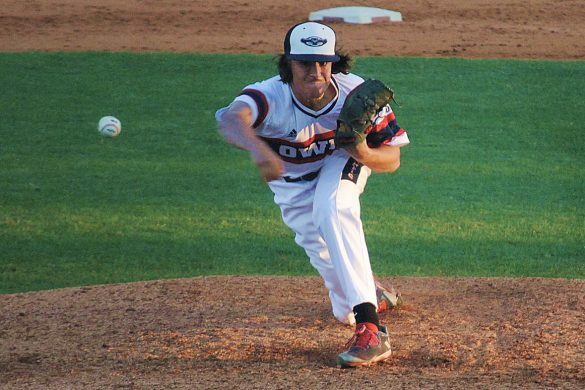 The Owls played to the level of their opponent, then let a close game slip away. Ken LaVicka (ESPN West Palm): Jason Driskel to Nate Terry touchdown to beat UTEP. The culmination of a 99-yard drive with no timeouts, Driskel’s exclamation point of the greatest sequence of his career was, in my mind, the Player of the Year for a unit that struggled to find it’s rhythm for much of the season. Kris Bartels (ESPN West Palm): It’s not often that you see a team come back with no timeouts and win on a last second Hail Mary. 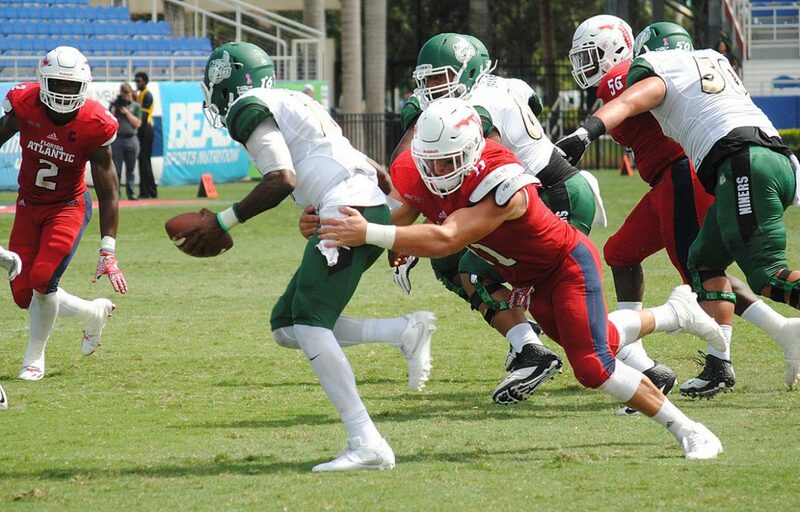 In FAU’s case, the Offensive Play of the Year was the final play versus Charlotte. Florida Atlantic got the ball back with no timeouts and was able to move the ball into Charlotte territory. Jason Driskel tossed it to the end zone and the ball was brought down by Kamrin Solomon. The initial call was a touchdown, but we know how this goes. The officials review the play and decide it is an incomplete pass, after there was plenty of footage that showed Solomon had one foot down. 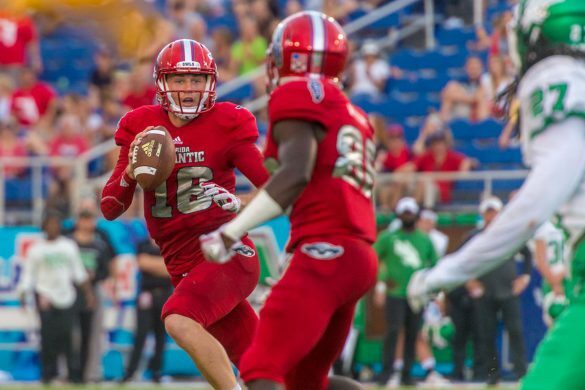 FAU lost and gave Charlotte their first Conference USA win and first victory over an FBS opponent. At that point in the season, FAU lost to the team down south to open up conference play and was on a four game losing streak. 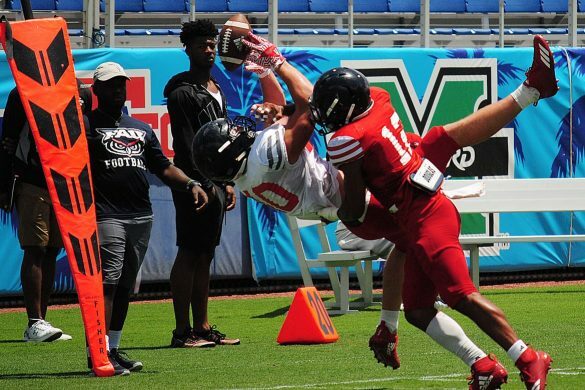 Jake Elman (OwlAccess.com): Freshman Pico Harrison didn’t do much in 2016 with only 18 catches, but his first catch of the year was easily his biggest. 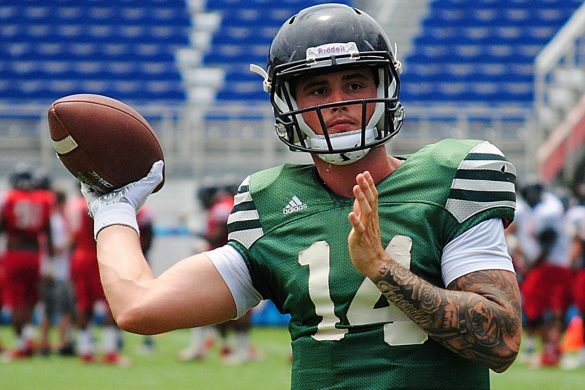 When a Jason Driskel pass against Southern Illinois caromed off several players, Harrison snagged the ball out of nowhere and took it 85 yards for an FAU touchdown. 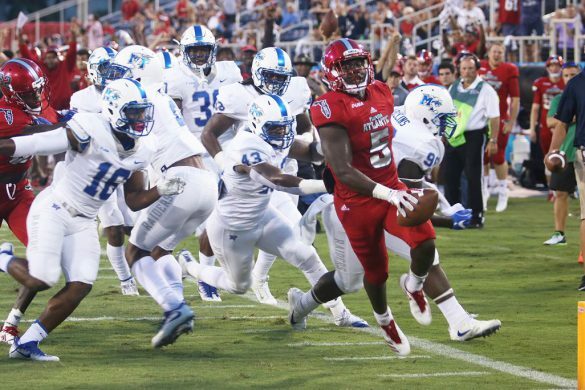 While it wasn’t the game-winning score and it was a play that became lost among the offensive struggles that were soon to follow, Harrison’s awareness and speed on the play should give FAU fans hope for what he can do in 2017. Brian Rowitz (ESPN West Palm): Jason Driskel to Jason Terry touchdown to beat UTEP. After so many late home losses, you could tell how much it meant to the team to be on the other end of one of these games. In what was shaping up to be disappointing loss the offense easily moved down the field and capped it off with a great one handed grab from Terry. Would also like to add that I’m not just picking this because I was filling in for Ken LaVicka as the play-by-play voice that game. 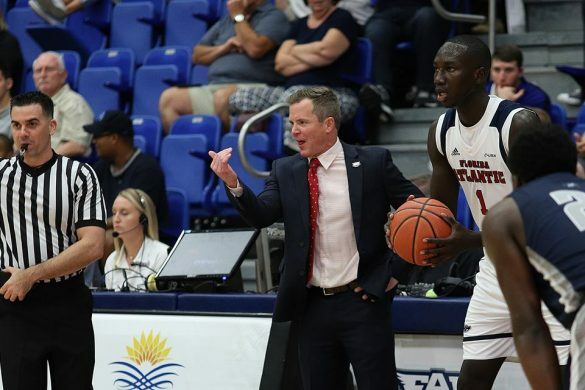 BOCA RATON – Four days before Christmas, shortly after the FAU defeated Webber International, Michael Curry had a gift for his team. In fact, Curry had several gifts for the now 4-6 Owls after their 77-57 victory over the Warriors, one of which was a blunt assessment about the team’s recent rust. While the Owls are 4-3 since returning to the mainland after a season-starting trip to Hawaii, the bizarre scheduling that had FAU playing only three times from December 6 to December 22nd has left many of the players rusty – and sometimes, ill-prepared – when they do finally return to action. 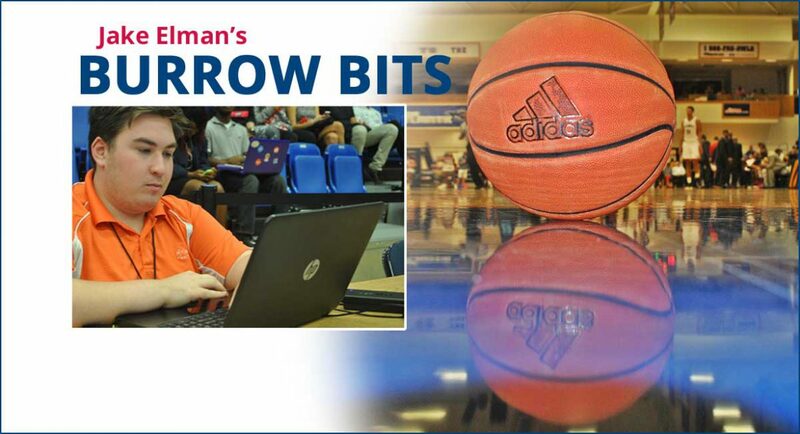 When FAU traveled to Miami Gardens for a showdown with the Hurricanes on December 16, the rust of not playing since their jubilant upset of Ohio State ten days earlier resulted in a blowout 77-56 loss. After the first 20 minutes, Curry’s team was down 39-24, enough of a deficit on the road that a strong second half couldn’t change things. 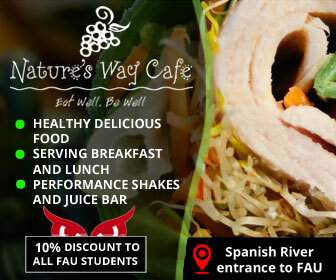 Curry then attributed FAU’s latest home victory over Webber International to improvements in tempo and awareness. 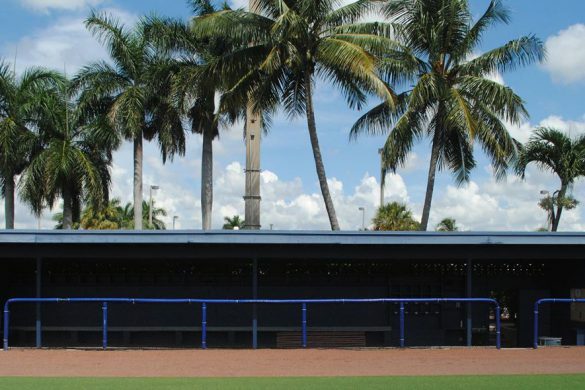 FAU had five days off between the Miami and Webber games, their quickest turnaround since a three day break between Hofstra and Ohio State. Since returning to the mainland, the Owls have only had two instances where they’ve had less than a full week between games; the first two home games against Edward Waters (November 20) and Hofstra (November 22) were the other two. Curry did address the scheduling shortly after the final buzzer against Webber, but also was quick to note that the massive amount of time between games isn’t only a problem that the Owls have. As Conference-USA play begins Saturday against Western Kentucky, the days of long breaks between games are over indefinitely. 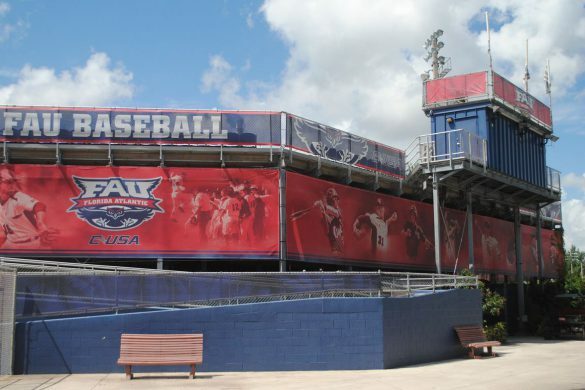 The longest break FAU is set to have in the coming months is a full week between a January 26 drive to FIU and a February 2 showdown with Charlotte. 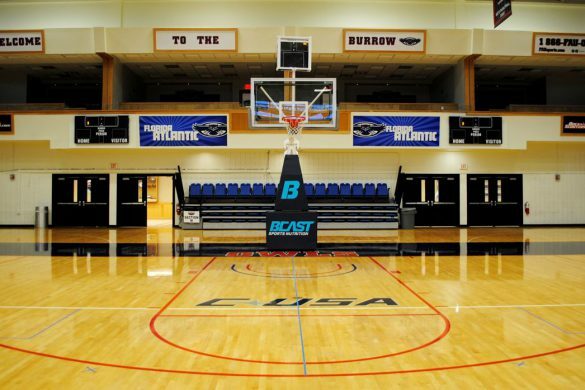 Now, as the Owls prepare for their final non-conference game of the regular season, Curry is hoping that the rust can be shaken off against Florida Gulf Coast. Curry said in his Wednesday press conference that the team would indeed have Christmas off before returning on the 26th, but there would be an earlier practice today because some players are coming back to Florida around midday. Another reason the Owls struggled at Miami and against Webber, according to Curry, is that those games came immediately following exams. FAU may try to counter that issue next season with a game at either Georgia Tech or Wake Forest – two teams the Owls are currently in scheduling discussions with. “If we fall flat maybe we fall flat in a guarantee game not in a home game,” Curry said. With double-digit scoring outings in three of his past four games, sophomore forward Jeantal Cylla could become a dangerous threat in conference play. If one takes Cylla’s 0-3 performance from the field against Miami out of the equation, the Lake Worth product made 58% percent of his shots against Hofstra, Ohio State, and Webber. Cylla also recorded his first double-double of the year in Wednesday’s win, putting up 10 points and grabbing 11 rebounds. Conference Counterparts: Someone has finally caught up to Middle-Tennessee, as both the Blue Raiders and the Rice Owls are tied with a 10-3 record. Working Women: Rice is also the top C-USA team in women’s basketball with a 9-2 mark. Also having played 11 games, 4-7 FAU will start conference play Friday against Western Kentucky and won’t be back in Boca until January 12 against USTA. 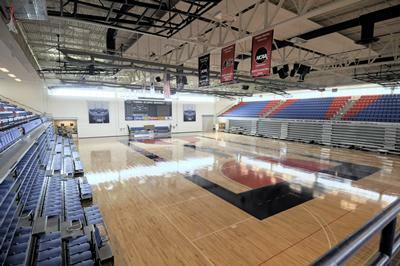 Game of the Week: Some may be tempted to put the FGCU game here because of its 9-5 record, but it’s always hard to go against the start of conference play. Western Kentucky comes to The Burrow on New Year’s Eve, bringing with them the player with the best name in C-USA basketball – University of Hartford transfer Pancake Thomas.